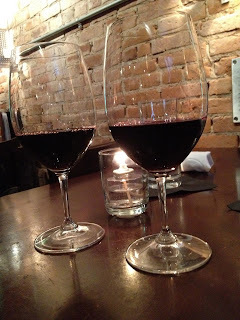 Last week we decided to go upscale for our weekly happy hour, so we headed to Vinology. This is a perfect destination to enjoy your favorite glass of wine, or to try something new-- from their list of 50 wines by the glass, or 100+ wines by the bottle. If you're not sure what you want, it's also possible to have a wine flight created for you-- or you can try some of the flights that they create. The next time I am in the mood to splurge, I plan on trying "When dirt tastes good"-- although at $21, it's not in our happy hour budget. Happy hour ends at 6:00, so we hustled in at 5:50, and announced our plan to take advantage of the special pricing. 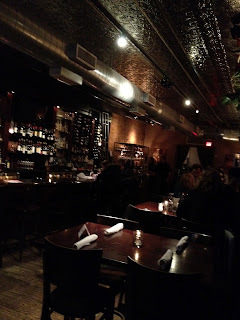 We had a very friendly and accommodating waiter, and our choice of nice tables in the bar. Both the bar and the dining room spaces are very nice-- and the bubble room would be a fantastic space for a party! Wine by the glass is 1/2 price, and they have an interesting selection. If you're not a wine drinker, some of the draft beers are $3, but the focus here is on the wine, and they're doing a great job, as illustrated by winning the 2011 Open Table Most Notable Wine List award. The happy hour food offerings were sliders and the featured pizza-- both priced at 1/2 off. As usual, we ordered both, with the intent of splitting them. Next time we'll probably just do the pizza and wine-- although the salads look fantastic too, and would be a good addition. 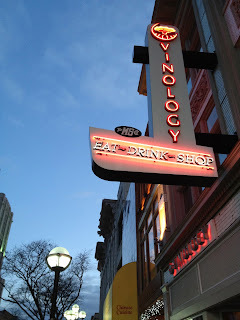 This was a great happy hour-- we'll be back!